Charles Farris lighting tapers,approx 55 per box and 12" long. Matches can drop debris into the candle, affecting the quality of the burn. 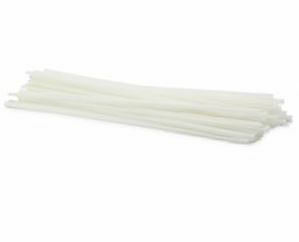 Wax Tapers - Pack of 55 is published by Charles Farris and is our 1066th best seller. The ISBN for Wax Tapers - Pack of 55 is LT-01. Be the first to review Wax Tapers - Pack of 55! Got a question? No problem! Just click here to ask us about Wax Tapers - Pack of 55. A:I hope this answers your query and thanks for using the Q&A forum. .
What colour are the tapers in this pack of 60 and what is the diameter of the bottom of each taper? A:These particular tappers you are enquiring about are white and the diameter of the bottom of the tapers measures around 4mm, I hope this helps. What dimensions are the Tapers Pack of 60 and how long will one taper burn for? A:Each taper in the pack of 60 measure approximately 30cm in length and 0.4cm in diameter. We estimate that each taper would burn for no longer then 5 minutes.